Several risk factors have been associated poor adherence with asthma medications and/or poor adherence with a written asthma action plan. More than 2 lakh people die every year because of the unavailability of asthma pump during the time of asthmatic attack. Asthmatic people often tend to forget to follow their basic medication prescribed by their doctor.For instance it is possible that a person took the pump in the purse while going out but in the way the purse was stolen or lost and during this time the person gets the attack, this can be fatal. NL is an innovative start-up which aims to provide a unique way to carry asthma inhalers. The above mentioned problem can be addressed by adding a modification to a wrist watch. This modification contains a coiled tube which will contain the liquid used in the inhalers. This will help people in case of sudden emergencies. Further, the device will have markings to indicate the level of liquid left in the inhaler and when finished can be refilled by the user. To sum it all up, our product will serve as a miniature inhaler fitted within a watch which is easy to carry,light weighted and effective to use. Our product work on Bernoullis principal, which is applicable in a spray. Any spray works like an atomizer. When the rubber ball or in this case pump is pressed, it sends a steam of air which passes through the tube. The velocity of the air is very large in the constricted part of the tube so that the pressure in that part is lowered. Consequently liquid rises in the tube and is mixed with air and comes out in the form of a fine spray. Our device be fitted in the watch it consist of a rubber belt from two sides which provides an attachment to the belt of the wrist watch. The strip has a round attachment made up of metal the man attachment consist of two parts the first one being a coiled tube which will contain the liquid medicine and the second is the button which is on the opposite side of the spray opening. 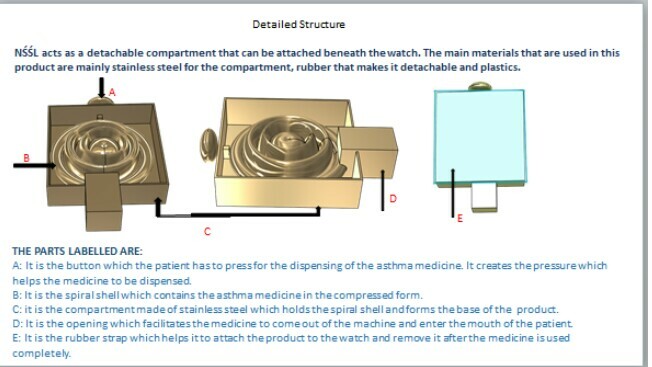 The most important part is the spray opening which consist of a pipe which is at one end of the watch opposite to the button from here the medicine will be sprayed out. The middle device is re-attachable so when the medicine is finished the person just needs to replace the middle attachment. This product is recyclable, the coil can be refilled, hence the user can use our product for a very long time. This reduce the product waste that harm the environment, once bought the consumer just need to refill the tube when finished and not throw the whole product. Even the material used can further be recycled to create the same product and this reduce environmental waste . For our initial project we will focus and target asthma for the first few years but with growing time we may include many other diseases related to this mechanism. Since the mechanism for inhalers regarding breathing problems is same we can use this device for curing many other lung diseases by just changing the medicine filled in the spiral tube. It is the only product which helps people to carry their asthma pumps in an innovative and effective manner. The fact that the product is attached with a wrist watch and can be replaced , further adds up to its advantages. Even the product is not very expensive it might range from $10-$12 Which is approximately 800 INR , and thats not a big amount in India , its reasonable. Also adding to the fact that its a kind of one time investment , the user just need to refill the medicine after its finished and you are done. 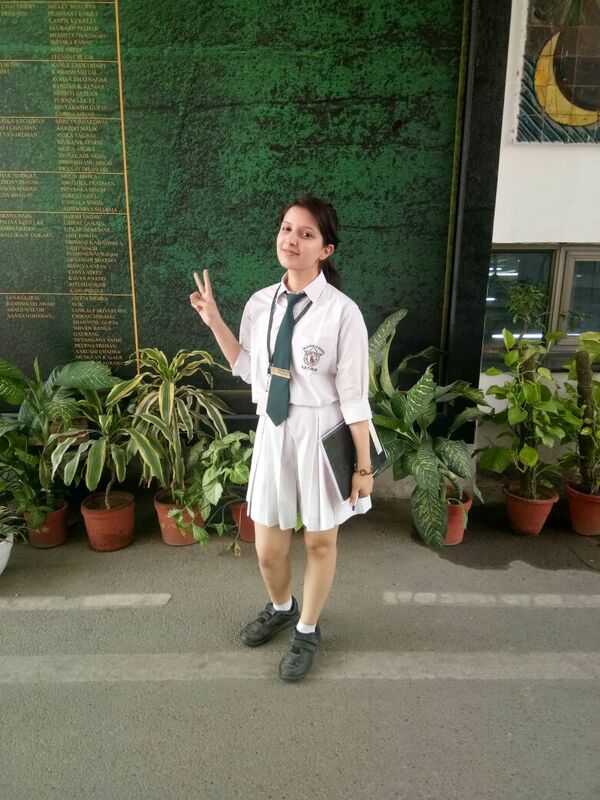 I am Sheetal Kumari a student of class 12 , my age is 17 years. I belong from an average middle class family of India. My financial background is comparatively low and hence I don't have funds to encourage my project in future. This project can saves life, a person in need can understand how this can save a precious soul. Regarding my motivation, I got this idea when my friend died because of the same reason.That day I decided that I won't let any other precious soul to die because of this stupid reason and hence I came up with this idea. I am very determined to encourage this idea, I have also presented my projects to my country's government for financial help and am waiting for their reply. This project is not only mine effort, it an outcome of a really good team consisting of Lavya, Samriddhi and Namrata. THANK YOU SO SO SO MUCH FOR YOUR COMMENT, I JUST CONVERTED YOUR COMMENT TO ENGLISH AND AN AM SPEECHLESS. THERE ARE VERY LESS PEOPLE IN THIS WORLD YOU REALLY APPRECIATE SOMEONE ELSE WORK . AND I AM SO SORRY I WAS NOT ABLE TO REPLY EARLY, I WAS JUST BUSY WITH MY CLASS 12 MIDTERM EXAM , WHICH IS VERY IMPORTANT TO ME. THANKS AGAIN FOR ALL YOUR SUPPORT. 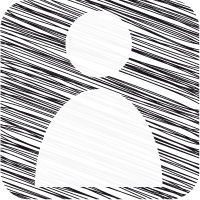 I AM CURRENTLY NOT USING WHATSAPP BUT YOU CAN MAIL ME ANYTIME ON [email protected] . Ravi de vous voir en finale. Je serais plus ravi de vous finaliser cette oeuvre salvatrice. J'ai aussi ami décédé parce qu'il ne disposait plus de ventoline sur lui lors de sa crise d'asthme. Peu s'en fallait une autre aurait perdu la vie à cause de la même cause, car j'étais à côté et vers 2h du matin je suis parti en pharmacie lui payer le médicament. J'aimerais bien être représentant de votre marque dans mon pays. Merci pour la compréhension et Courage. Thank you everyone for all your support and encouragement . Its people like you who motivate me to something different everyday . I love how this competition helped me to connect to so many people. Thanks again for commenting.Regurding your query, no its not the final product it just a rough prototype. There are many minute detail left. The second answer is yes you won't have problem cleaning it because you don't need to clean it that often. Just deattach the device and since its waterproof you can simply wash it out. Thank you so much for your kind words . It means a lot to me, i just hope i stand up to your expectations. Just keep on motivating, it's people like you who inspire people like me. Your project is awesome. Great idea and Great comments. THANKS FOR YOUR VALUABLE COMMENT . I KNOW THE COMPETITION IS ABOUT TO END . SO WOULD JUST SAY BEST OF LUCK AND NO MATTER WHAT EVER IS THE RESULT NEVER GIVE UP. MAY THE BEST TEAM WIN. THANK YOU SO MUCH FOR COMMENTING YOUR VALUABLE OPINION ON MY PROJECT. I AM SO PROUD OF YOU , LIKE SERIOUSLY . YOU HAVE CAME SO FAR , I JUST WANT TO SAY ALL THE BEST AND PLEASE NEVER GIVE UP . SEEING PEOPLE LIKE YOU INSPIRE ME. I KNOW ASKING FOR VOTES IS TOO MUCH SO I WON'T ASK FOR IT , BUT I WOULD DEFINITELY WANT YOU TO TAKE A LOOK AT MY PROJECT AND GIVE ME SOME MORE VALUABLE FEEDBACK . TRUST ME IT MATTERS A LOT TO ME . SO PLEASE COMMENT AND LET ME KNOW WHAT I CAN IMPROVE IN MY PROJECT. Dear Sheetal congratulation for this prototype. Very practical and innovative. Has anyone already used it, do you have some examples or concrete experience already? Is this the final product? And just one more question, is it easy for cleaning? Good luck with producing and distribution. THANKS FOR YOUR KIND WORDS , ITS PEOPLE LIKE YOU WHO KEEP PEOPLE LIKE US GOING . WOULD TRY TO STAND ON YOUR EXPECTATION . TO BE HONEST THERE ARE SO MANY PEOPLE IN THIS WORLD WHO DEMOTIVATE US BUT THEN THERE ARE PEOPLE LIKE YOU WHO ENCOURAGE US , YOU DON'T KNOW HOW MUCH YOUR WORDS MEAN TO ME . I THINK THIS COMPETITION IS NOT JUST ABOUT COMPETITION ITS MORE ABOUT LEARNING AND POLISHING YOUR PROJECT . I LEARNT A LOT ABOUT THE NEW EXISTING TECHNOLOGIES AND TECHNIQUES BY TAKING TO ALL THE OTHER PARTICIPANTS. THIS MEANS A LOT TO ME. IF I AM ABLE TO LEARN SOMETHING NEW EVERYDAY I THING MY PURPOSE IS FULFILLED. Very impressive project you have here. I am truly impressed that you are developing a solution to a fatal health problem right from school even before graduation. The fact that you have learned from a situation that happened to your friend and decided to help others makes this a noble cause. I wish you all the best and hope that you find a sponsor to provide substantial financial aid for your project. Wow, this is a great project. I guess some questions have been asked already pertaining the project in the comments section. Keep pushing and don't give up; irrespective of the funds etc. exceptional idea.!! great job done here. the basic fact about this startup is that it covers people of all economic strata this also makes it unique and helpful. amazing jobs..!! kudos to the good work done.. THANKS FOR YOUR KIND WORDS , ITS PEOPLE LIKE YOU WHO KEEP PEOPLE LIKE US GOING . WOULD TRY TO STAND ON YOUR EXPECTATION . JUST KEEP ON MOTIVATING , BECAUSE TRUST ME YOUR WORDS ARE LIKE OIL TO MY LAMP OF HOPE. THANKS FOR COMMENTING AGAIN AND THE PLEASURE IS ALL MINE. ITS SO KIND OF YOU TO COMMENT ON MY PROJECT. SERIOUSLY I APPRECIATE IT. HERE EVERYONE IS SO COMPETITIVE ITS GOOD TO SEE THERE ARE FEW PEOPLE LIKE YOU WHO SEE THINGS BEYOND COMPETITION . AND I AM HAPPY I MET PEOPLE LIKE YOU IN THIS COMPETITION. THANKS FOR COMMENTING , I KNOW THE END OF THE JOURNEY IS NEAR . I WILL MISS THIS EXPERIENCE . GOING EVERYDAY AND REMINDING MY FRIENDS TO VOTE. COMMENTING AND REPLYING TO YOU PEOPLE . I AM GOING TO MISS IT. REGARDING YOUR PROJECT I ALREADY VOTED AND COMMENTED FOR IT. I think your project is very very interesting i am so happy to see people who fight for giving a second chance to athers to live! I am amazed congratulations keep it up! Hello Sheetal! I'm glad whenever I sight ideas built on the motive of addressing a pressing need or problem. I believe you can increase number of survival of asthma patients through your technology. I advice you to continue the good trial because it will yield something great in the future. Thanks for your comments on my idea page. Thank you for appreciating me. I congratulate you for your grand success. I have gone through your project which clearly reveals that asthma will be overcome completely one day and I am surprised to see such a great solution for asthma disease. I never thought about such creative ideas when I was in 12th grade. This project is indeed one of the major steps to your bright future. I know that your creativity towards asthma might have taken several attempts and there might be ups and downs while developing this great project. But you are already many steps ahead than all others in this world because no one thought to solve asthma in this manner. Always keep this level of energy for developing this project and eventually you will smile at the end !!! I cannot stop from voting you. Three cheers for humanity !!! Best of luck and best wishes for your future work. I WOULD LIKE TO THANKS EACH AND EVERY ONE WHO TOOK A LOOK OF MY PROJECT AND GAVE ME THEIR VALUABLE FEEDBACK. THANK YOU VERY MUCH YOU DON'T KNOW HOW MUCH IT MEANS TO ME , I AM DOING ALL THIS TO JUST IMPROVE MY PRODUCT MORE AND MORE AND YOUR FEEDBACK IS HELPING ME TO DO THAT . WOULD TRY TO STAND ON YOUR EXPECTATIONS . JUST KEEP ON MOTIVATING , BECAUSE TRUST ME YOUR WORDS ARE LIKE OIL TO MY LAMP OF HOPE. THANK YOU SO MUCH FOR THE WORDS OF APPRECIATION , EVEN I WANT MY PRODUCT TO REACH TO AS MANY PEOPLE AS POSSIBLE . I WILL TRY TO IMPLEMENT IT AS SOON AS POSSIBLE . AND THANKS FOR SAYING THAT IT WILL BE A TURNING POINT ON ASTHMA MEDICATION YOU DON'T KNOW HOW MUCH THESE WORD MEAN TO ME. YAA I KNOW ONLY 3 DAYS ARE LEFT FOR THE FINALS WILL DEFINITELY SUPPORT EACH OTHER , I KNOW ITS THE TIME WHEN WE FEEL NOT ONLY BUTTERFLIES BUT THE WHOLE ZOO IN SIDE OUR STOMACH . I WOULD JUST SAY STAY STRONG AND HOPE FOR THE BEST. Your project is amazing.Being an asthma patient myself I understand fully how problematic the disease is.It is really very difficult to find the level of medicine in some inhalers and due to that when you take the medicine you can't recognize that you got the full dose or not.Your project will be a turning point for asthma medications .I hope it gets implemented soon .Good Luck to you.I will definitely vote for you tomorrow as my voting time is gone for today. Thanks for your kind words. Regarding you question i know every product has two sides . Every good has something bad hidden in it. In my case i think if the watch gets stolen then it would be a very big disadvantage because see the present conditions Theft is one of a very common problem in India. Thanks for your kind words, about what you said. I think eliminating the root of asthma is a little time taking task, there are so many doctors working on it. I think asthma can be caused in life time or while birth it can be due to pollution or it can also be because of weak respiratory system. Thanks for your advice will surely look upon it. Thanks for your kind words, i know people suffering from asthma often face such problems like getting attack when they don't have there pump with them . Regarding your question yes it is waterproof .As we designed it in such a way that it remain with the user 24/7 . Thank you and feel free to ask any thing. Wao, this is a big project. Making life easy for asthmatic patience is one of the best thing to be done for those having this challenge. One of my female students once collapse during class hour and the unfortunate thing is she was not with her inhaler. Yes wearing the instrument in their hands is good, but is it water proof? You know most of my students are Muslims, and they do ablution when preparing for prayers. Most of the time i see them wearing wrist watch to do ablution and the watches usually get damaged after ward. But its an amazing idea and the Muslim asthmatic patience should be asked to always remove it during ablution if it not water proof. Thank you on your comment for my own idea. A great thinking for tha asthma patients as really they need this type of product in emergency. Your friend died because of this and this is the reason for you to do more so I strongly believe you will achieve this, I also wish government will finance you on this project. But in mean time if we try to focus on root cause of asthma to prevent asthma diseases than its also a very good for them. ALL THE BEST !! Hey as u have given description about your project it was to good that i was lost in only thinking about the advantages but for a while i am also intrested to know its disadvantages so pls tell me if u have no objectons.. THANKS FOR THOSE KIND WORDS, WOULD LOVE TO SPEAK TO PEOPLE LIKE U IN FUTURE. LOVED YOUR COMMENT . THANKS FOR OFFERING HELP WILL SURELY LOOK FOR WARD TO IT. AS I SAY ITS PEOPLE LIKE YOU WHO KEEP US MOTIVATED . I JUST HOPE YOUR NGO ALSO GAIN GREAT HEIGHTS , WOULD LOVE TO SEE PEOPLE LIKE YOU GROW. THANKS FOR SUCH SWEET WORDS, ITS A PLEASURE TO HEAR THOSE WORDS FROM UNKNOWN PEOPLE WHO GIVE US UNBIASED OPINIONS. ITS PEOPLE LIKE YOU WHO HELP US MOVE FORWARD. THANKS FOR APPRECIATING MY WORK. I KNOW ITS VERY RARE TO SEE GOOD YOUNG TALENT. TO BE HONEST THERE ARE SO MANY PEOPLE WHO TRY TO STOP US BUT THEN THERE ARE PEOPLE LIKE YOU WHO KEEP ON MOTIVATING US. Yo girl, loved ypur project. Happy to see such young talent coming up. I want to ask if you think it can be a new change in the society. I hope you go further in this competition. Will surely support you. SORRY FOR THE LATE RESPONSE .THANKS FOR YOUR KIND WORDS , ITS PEOPLE LIKE YOU WHO KEEP PEOPLE LIKE US GOING . WOULD TRY TO STAND ON YOUR EXPECTATION . JUST KEEP ON MOTIVATING , BECAUSE TRUST ME YOUR WORDS ARE LIKE OIL TO MY LAMP OF HOPE. Amzing girl good to see someone is taking such keen interest in improving the condition on the present medical issues. i hope people support you, because trust me i am going to support you. SORRY FOR THE LATE RESPONSE .THANKS FOR YOUR KIND WORDS , ITS PEOPLE LIKE YOU WHO KEEP PEOPLE LIKE US GOING . WOULD TRY TO STAND ON YOUR EXPECTATION . JUST KEEP ON MOTIVATING , BECAUSE TRUST ME YOUR WORDS ARE LIKE OIL TO MY LAMP OF HOPE. REGARDING YOUR QUESTION I THINK 12$ IS ENOUGH FOR THE PRODUCT AND IT NOT TOO EXPENSIVE IN MY OPINION . SO THANKS AND FEEL FREE TO ASK ANY THING IN FUTURE. SORRY FOR THE LATE RESPONSE .THANKS FOR YOUR KIND WORDS , ITS PEOPLE LIKE YOU WHO KEEP PEOPLE LIKE US GOING . WOULD TRY TO STAND ON YOUR EXPECTATION . JUST KEEP ON MOTIVATING , BECAUSE TRUST ME YOUR WORDS ARE LIKE OIL TO MY LAMP OF HOPE.EVEN I WANT IT TO COME AS SOON AS POSSIBLE IN THE MARKET. SORRY FOR THE LATE RESPONSE .THANKS FOR YOUR KIND WORDS , ITS PEOPLE LIKE YOU WHO KEEP PEOPLE LIKE US GOING . WOULD TRY TO STAND ON YOUR EXPECTATION . JUST KEEP ON MOTIVATING , BECAUSE TRUST ME YOUR WORDS ARE LIKE OIL TO MY LAMP OF HOPE. ALSO THANKS FOR YOUR SUGGESTION. SORRY FOR THE LATE RESPONSE .THANKS FOR YOUR KIND WORDS , ITS PEOPLE LIKE YOU WHO KEEP PEOPLE LIKE US GOING . WOULD TRY TO STAND ON YOUR EXPECTATION . JUST KEEP ON MOTIVATING , BECAUSE TRUST ME YOUR WORDS LIKE OIL TO MY LAMP OF HOPE. THANKS FOR YOUR KIND WORDS , ITS PEOPLE LIKE YOU WHO KEEP PEOPLE LIKE US GOING . WOULD TRY TO STAND ON YOUR EXPECTATION . JUST KEEP ON MOTIVATING , BECAUSE TRUST ME YOUR WORDS LIKE OIL TO MY LAMP OF HOPE. THANKS FOR YOUR KIND WORDS YES YOU ARE RIGHT OUR PRODUCT IS REALLY AFFORDABLE AND USER FRIENDLY . WE DESIGNED OUR PRODUCT THINKING ABOUT EACH SECTOR OF THE SOCIETY, WHICH INCLUDED A MAJOR SECTOR OF PEOPLE YOU CAN AFFORD EXPENSIVE PRODUCTS. THANKS FOR YOUR KIND WORDS, I KNOW IN THIS WORLDS ITS REALLY TOUGH TO MAKE A MARK. YOUR ENCOURAGING WORDS MEAN A LOT TO ME. JUST KEEP ON SUPPORTING , I THINKS THIS COMPETITION IS BEYOND JUST COMPETITION ITS A PLATFORM TO APPRECIATE PEOPLE LIKE YOU AND ME. REGARDING YOUR QUESTION I SEE MY SELF AS A REALLY SUCCESSFUL SOCIAL INNOVATOR, I WANT MY PRODUCT TO REACH TO ALL PARTS OF THE WORLDS . AS SOON AS I GET ENOUGH FUNDING I WILL START MY WORK TOWARD IT. I SEE MY SELF SAVING LIVES IN FUTURE. I WOULD LOVE TO ANSWER YOUR QUESTION, AS YOU SEE MY AGENDA IS MAKE THIS PROJECT REACH TO ALL CORNERS OF THE WORLD . THINKING ABOUT THAT I MADE MY DEVICE DEVICE REALLY AFFORDABLE . ITS LIKE 12 DOLLARS WHICH IS APPROX. 800 INR. I THINK THATS QUITE AFFORDABLE SEE ITS RESULTS. THANKS FOR YOUR KIND WORDS, DEFINITELY I WANT TO CONVERT MY IDEA INTO REALITY. I SEE PEOPLE IN WORLD USING MY DEVICE AND I SURELY WILL MAKE IT HAPPEN . AS SOON AS I GET FUNDING FROM ANY SOLID ORGANISATION I WILL START MY WORK . 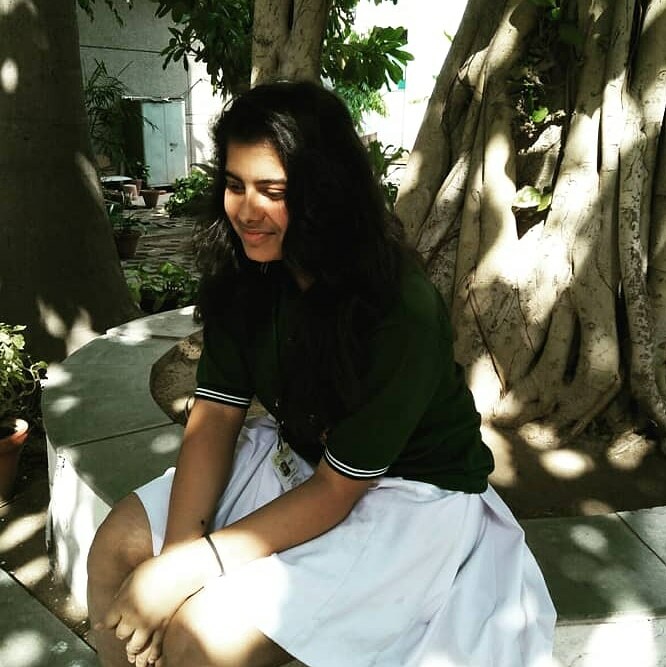 i am very jubilant to see that young budding thinkers have thought so profoundly and greatly which will embark a very good impact on the society and helping people in need with their unique ideas.sheetal has done very good to mankind by inventing a very eccentric watch which will be at your service at any time you need help. FOR YOUR KIND WORDS BELIEVE ME ITS PEOPLE LIKE YOU ONLY THAT KEEPS ME MOTIVATED . AND THANKS FOR YOUR KIND WORDS. JUST KEEP MOTIVATING PEOPLE , ITS REALLY AN AWESOME FEELING TO HEAR SUCH WORDS. loved your idea keep on growing like this. I know you will achieve your goals in the future . Proud of youth power. Just believe in yourself because i believe in your project. It's a great initiative from your side.. it will definitely be a very great help to the people who are suffering from asthma and frequent medication. by the way how do you plan on turning this idea into reality ?this seems to be really a complicated working process. Hey sheetal i had one question by seeing ur thinking abilities as u had mentioned so i think u may have got much confidence in urself that u can do much better things in future so my ques to u is..
Where u see your self in future? I am from Delhi , i am totally a fan of your idea. Being myself suffering from asthma make me personally connect with your idea. The way you though of something which will reduce the cause of death due to asthma is commendable . Just keep on working and i hope you get success. Regarding your project i must say i am totally impressed . Good to see Young entrepreneurs like you coming up with such amazing ideas. I would like to ask you if you get selected what you will do? Accourding to what I Know the winner won't get any cash prize ? Keep on going , i really liked your project. If in future you need and help please feel free to contact me or you can also go yo my NGO's website. Its people like you who inspire us to do good for the society. I liked your project , i think people like you should come ahead more and more. Its very hard to believe that you are in just high school. There are lots and lots of people who have so many degrees but still can't come up with such amazing ideas. You go girl , loved your project . Would love to see you complete your dreams . I have just one query is it affordable for less privileged people. Is it too expensive or affordable? a) you can say that my project it to make a device that help people suffering from diseases like asthma but main motiv is to make it very affordable for common people. This product should not be just for rich people , it will be for everyone who need it. so my future plan is to make it affordable . b)right now i am just trying to improve my project to some extent but in future i will collaborate with the government as well as doctors. c)my main agenda is to save lives not to earn profite so i think i can collaborate with hospitals and government to sell the device at a really cheap price so that they can distribute it further. 2) Sure would love to do that. Sorry for the late response and thank you so much for your kind words. Its people like you who are the fuel to my lamp of hope. Its your kind words only which keep me going. So sorry for the late response regarding your comment i love to see people like you. The are so many people you discourage people but there are very less people who support you. You don't know how much your words mean to me. Its like fule to my lamp of hope. So sorry for the late response regarding your question i know it's just few days left before the results are declared. I think if i get selected i would be very happy not only for myself but also for every life that my project can save in the future. Going to international level will also help me to get more investors for my initial funding. I will also try to present my project to the government body so that if they want they can help me to spread my agenda more and more. Regarding your comments , you don't need to say thanks for my vote and comment. Your project was worth it. I feel so good seeing people like you. I think this compitetion is beyond competition it more about appreciation of good work. Sorry for the late response but thank you so much for your love and support. Will definitely try to stand on your expectations.Keep on voting and commenting. Thank you so much for your positive approach its good to see that you appreciate my idea. Regarding the partnership , i will think about it. May be not now but in future we can work together . I think right now i would like to just polish my project. But thanks for the encouragement. Hi Sheetal Kumari. How are you?Fine I hope. I love your idea! This is a great project. Keep it up! It is a very nice initiative fo the patients of asthma. We need more people like you. OK very good. It's a good strategy from my point of view. But my question was mostly about how people will buy the product. I will take you the example of a revolutionary product that was born in my dear country Cameroon: the CARDIOPAD invented by Mr. Arthur ZANG. Indeed, a CARDIOPAD costs the tidy sum of 2,000,000 FCFA or about 1,000 $ USD, which is well above the reach of average households. Mr. Arthur ZANG has therefore decided to set up a system that allows hospitals to have CARDIOPAD and patients will only pay an annual subscription of 10,000 FCFA ($ 20 USD); you see that it is enough to have 100 patient subscriber / year to refund the purchase price of a CARDIOPAD. Propose this to hospitals. Show them that they can have income but do not forget to always put the patients first. A nice initiative and innovative project for patients of Asthma. I think this will really help them. I wish that your product will come into market very soon. Hi Mrs. Sheetal Kumari. First of all, I want to congratulate you on your brilliant idea, which will certainly change the lives of thousands of people around you. However, I would like to know if your pump is equipment for hospitals or individuals? If this is for hospitals, you could probably consider, in the near future, a portable and easy-to-maintain version that disadvantaged people could acquire through a contribution system. I would also like to know what is your business model. I really appreciate the idea that saves life.YOU are not saving just lives , but also ensuring future with your innovative idea .Good to see people still care about such major problems , truly innovative, something new and special . I hope you continue this project in future. This idea will help older people to a greater extent , as they tend to forget about their medication due to ageing. So as you said, you would further make progress in your idea , to treat other diseases which would require medications to be taken on time , it would be better to add any kind of notifying mechanism to give notifications which will make it more efficient. (Just my little suggestion).All the best!! With having asthma patients in my family, I feel like this project would bring all of them a lot of convenience. Kudos to the creator for coming up with such a creative idea at such a young age! I believe that this project has the potential to transform save multiple lives. It carries within it an opportunity for a change. It feels great to know that young entrepreneurs still care for the society and that humanity still persists in this broken world. It was really innovative and i liked reading it about and the thing u told that you got encouraged aftwr your friends death it was really appreciating that you are showing your intrest in saving many souls that reallybthe best part about u and i must wish that u surely get ur idea as tge best among all thankyou.. I really the idea of the project and I feel it is so much needed . Good initiative keep it up .Hope you win!!!!!!!!!!!!!!! Great idea will surely get success!!!!!!!!!!! Amazing idea. Very good It has a huge prospect. It will prove to be very good and helpful product in the future . Love it !!!!!!!!!!!!!!!!!!!!!!!!!!!!!!!!!!!!!! Very proud !!!!! Extremely interesting concept and helpful for asthma patients.i definitely support it and request people to give as much as encouragement is possible for it to be successful. Very good project. You care about people with asthma. Asthma pumps are needed by people with asthma, and your project is one of the solutions for them to take the asthma pump anywhere. Good luck.